In the jewelry world, one brand has attracted the patronage of 130 heads of state because of the outstanding quality of its products and professional service. That brand is Fanghua Pearls. Fanghua Pearls has also won the trust and favor of countless celebrities from around the world and people from all walks of life. Nancy Kissinger, the wife of former American Secretary of State Henry Kissinger, praised the beauty and high quality of Fanghua Pearls. Every day, customers are moved by the beauty of Fanghua’s pearls because Fanghua Pearls insists on choosing only the finest and most beautiful pearls from around world. Fanghua is given priority to select the finest pearls produced at the worlds top cultivation centers. Only one in a thousand pearls can meet the standards to become a Fanghua Pearl. The exquisite craftsmanship of Fanghua settings only adds to the refined luxury and elegance of Fanghua jewelry. Each design created at Fanghua, blends an internationally known designers’ skill and inspiration, meticulous attention to customer satisfaction, and highest level craftsmanship with originality in design. Fanghua jewelry is a perfect union of classic beauty and contemporary fashion. Fanghua’s warm, caring Chinese style hospitality has left a deep impression on presidents, celebrities, and innumerable distinguished guests. Fanghua’s shops are spacious, comfortable, and gracefully designed. Customers feel relaxed, at home, and respected. Mrs. Putin, wife of the Russian President, specially prepared a gift and presented it to Fanghua as a show of her sincere appreciation for the caring professional service she received at Fanghua. Since its establishment in the 1980’s, Fanghua Pearls has opened a number of high-end stores including those in Beijing and Shanghai. With many years of professional experience Fanghua has become the leader in its field, attracted more than 120 heads of state and a multitude of internationally famous clients. Fanghua Pearls continues to become ever more renowned in its field. 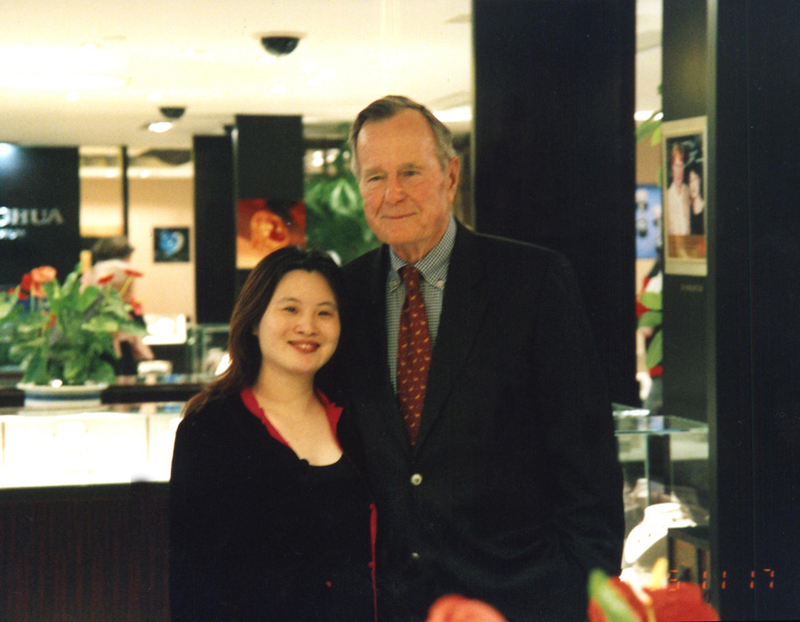 After attending the Beijing 2008 Olympics, American President Bush wrote a letter to express his appreciation for Fanghua’s thoughtful service. The beautiful, elegant, and noble oriental character of Fanghua Pearls has led this brand to become the most internationally famous and influential Chinese brand name in the high-end pearl market.